Ok, so it turns out my second new print of the year is also Star Wars related! Fans of the original trilogy will remember these weird musical characters from the New Hope episode IV. 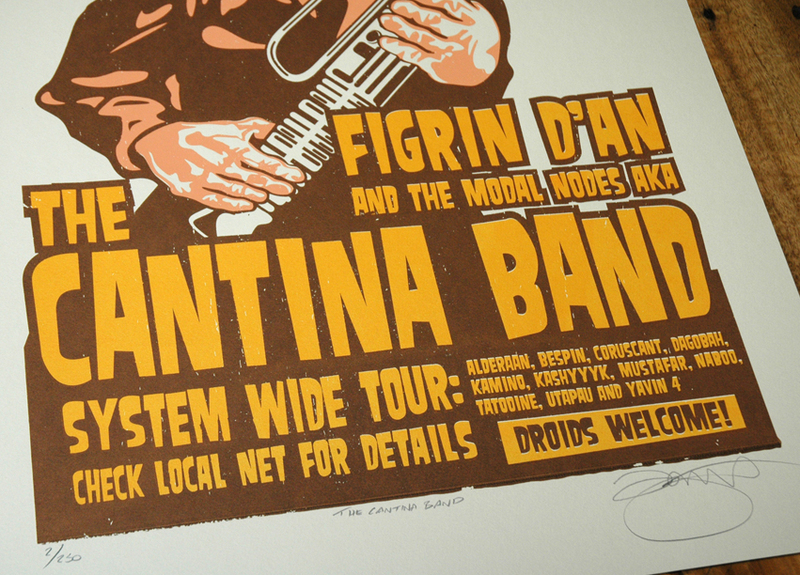 So here’s my take on what a Cantina Band tour poster might look like. Based on a previous digital print I did many years a go. This 3 colour hand pulled screen print measures 50cm x 70cm (approx) and is printed on 250gsm acid free art stock. Each print is signed & numbered and is strictly limited to an edition of only 250 so once they’re gone they’re gone. Posted in Prints. 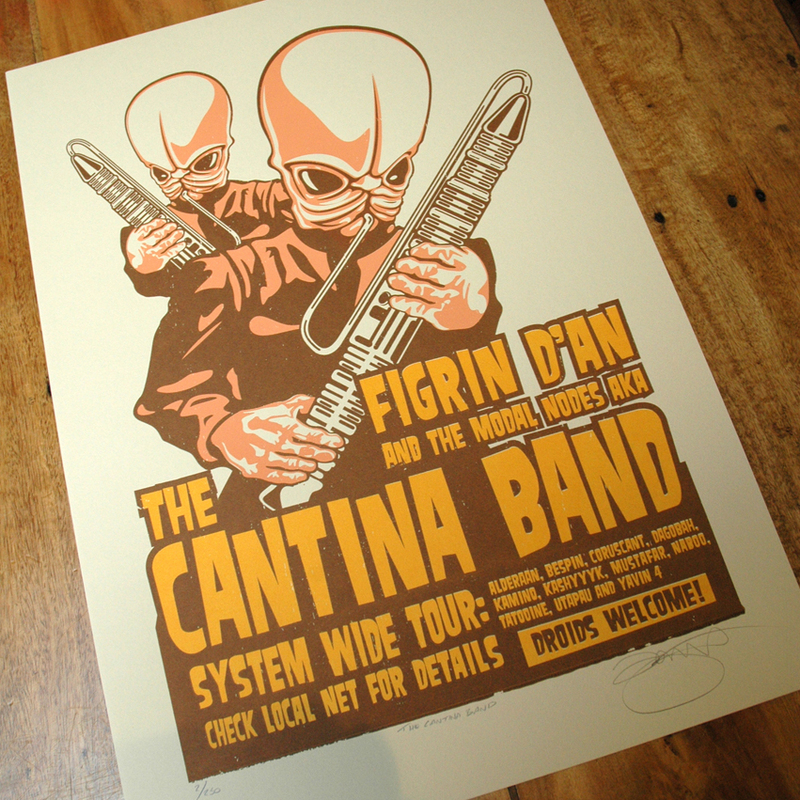 Tagged with Art, Cult, Film, geek, Humour, Mos Eisley, Music, Sci-fi, Science Fiction, Screen print, Star Wars, The Cantina Band. 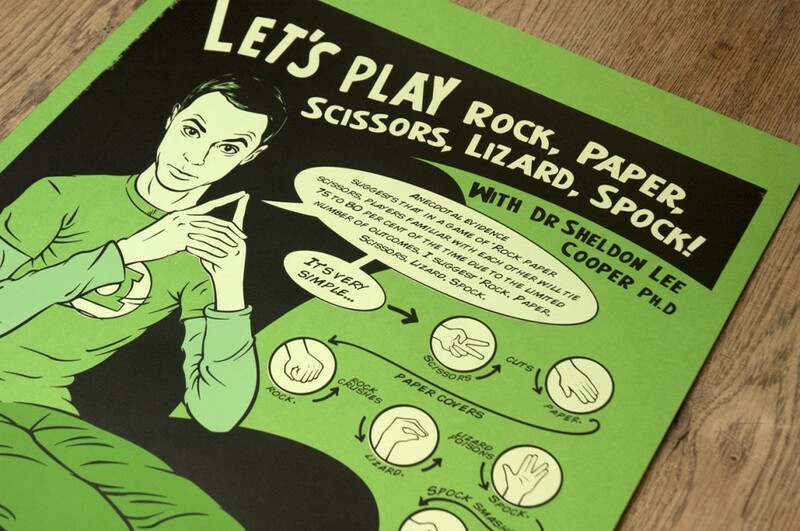 Lets play, Rock, paper, scissors, lizard, Spock!! I’ve been wanting to do a Big Bang Theory print for ages and I’ve finally come up with something that I think even Sheldon would like! The Big Bang Theory is pretty formulayic but I love it as it speaks to my inner geek! This particular quote is from the season 2 episode “The Lizard-Spock Expansion”. Bazzinga! This four colour hand pulled screen print measures 42cm x 59cm (approx) and is printed on high quality acid free 320gsm art stock. Each print is signed & numbered and is strictly limited to an edition of 250 so as always once they’re gone they’re gone! Posted in Prints. 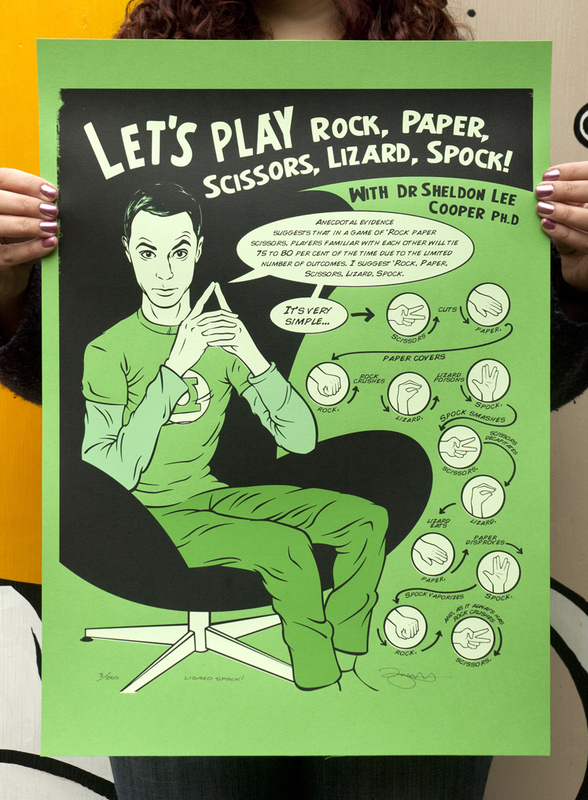 Tagged with Art, Bazinga, Black, Green Lantern, Green., Humor, Print, Retro, Screen print, Screenprint, Sheldon Cooper, The Big Bang Theory, Throwback.